In these tough economic times, going to court can be an expensive and time consuming manner in which to come to a resolution of a dispute. Alternative dispute resolution options are becoming a more popular way to resolve legal matters without the frustration of waiting for a court date and without incurring the expense of litigation. In Massachusetts, the most common alternative dispute resolution techniques used are mediation and arbitration. Mediation is an informal, confidential process in which an independent (neutral) mediator works with the parties to encourage and facilitate a resolution. A mediator cannot impose a solution on the parties; rather the mediator assists the parties in formulating their own agreement. The benefits of mediation include the fact that mediation allows the parties to control the outcome rather than a resolution being thrust upon them by a third party and mediation can often occur quickly, unlike formal court proceedings. Mediation is not binding. If no settlement is reached by the parties, the parties are free to pursue their dispute in court. Arbitration is a process in which the parties agree to have their dispute decided by a neutral third party. Unlike mediation, arbitration is final and binding. The parties present their positions to the arbitrator, and the arbitrator decides the matter, much like a judge. The benefit of arbitration is that it can occur more quickly than formal legal proceedings, and is generally less expensive than formal litigation. The drawback of arbitration is that the arbitrator’s decision is final, meaning generally there is no right of appeal. 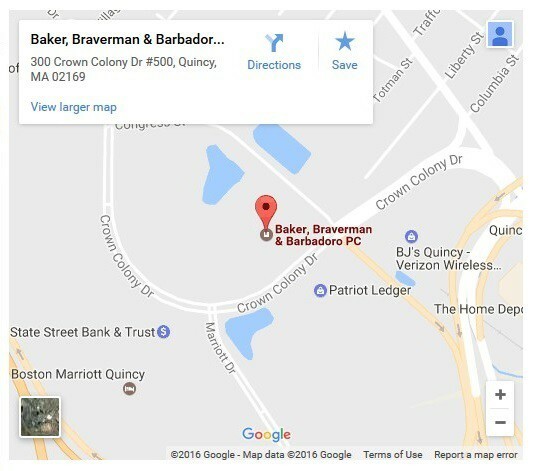 At Baker, Braverman & Barbadoro, P.C., we encourage clients to participate in alternative dispute resolution as an efficient and cost effective means of resolving our clients’ disputes. Our attorneys are skilled at presenting clients’ cases in both mediation and arbitration situations.